Hello and Welcome to the first day of previews for the Sparkle Creations Rubber Stamps January release! Sparkle is releasing 2 new images at midnight EST this Saturday, February 12 .. Today we are previewing Chef Oliver (and a new sentiment)! This sweet image reminded me of the brief time when I worked as a prep cook. At one time I had planned on going to culinary school to become a professional chef.. things didn't work out as I had realized my passion for cooking later in life and soon realized that restaurant hours wouldn't work well with a family.. Anyway, I remember we used to wear these not so flattering blue striped pants and white coats (and the white coats always got really dirty and stained). The sous chef always wore these bright colored pants and chef coats, so I colored Oliver to look like him. 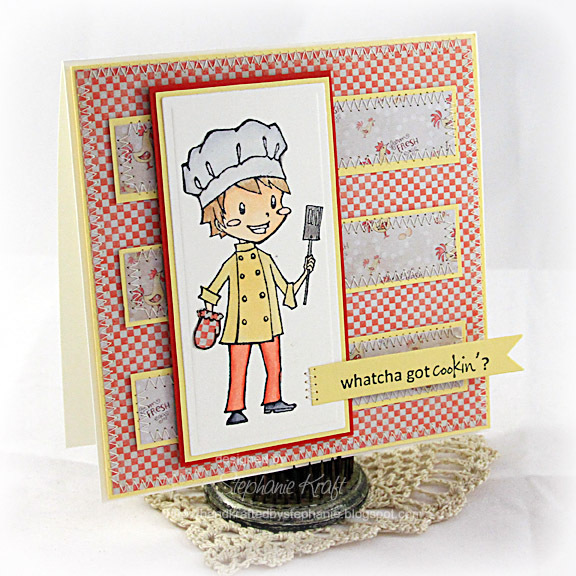 Be sure to visit the rest of the SCRS designers for more peeks of Chef Oliver. Sparkle will be giving away a Chef Oliver to one lucky person! For a chance to win, you need to comment on all of the designer's blogs (list below). Then head on over to the SCRS blog and comment on the Oliver post. You have until midnight EST each day to comment. The lucky winner will be announced the following day! Accessories: Long Rectangle Nestabilities (Spellbinders), Double-Ended Banner die (Papertrey Ink), Markers (Copic), Foam tape, Thread, Sewing machine. This is just darling, love the bright colors! Stephanie - such a cute image and so beautifully coloured! I really like the design of the card, and the super papers. It's fab! So Cute. Luv the card. So funny, I was just commenting on Sparkle's blog that I've got that same song going around in my head, too! Beautiful card, Stephanie. And I enjoyed hearing the story of how you once dreamed of being a chef. Do you still like to cook? It was so nice meeting you at CHA. I just wish we'd had more time to relax and not keep you up so late! Oh so pretty - it looks like you had fun making this card :) TFS! Darling card! Love the checkered oven mitt! Adorable! The background red checkered paper it great for this stamp! Great job! What a darling card. I love how you did his oven mitt. Oh my Stephanie! Oliver is darling! I love the paper pieced cooking mitt and you did a great job coloring him! Have to say - that paper-pieced oven mitt is the perfect finishing touch on a very cute card. Love your stitching - your card is adorable! So cute! Love the sentiment banner stitched to the main panel! this is so sweet! love the colors you used. fab card, Stephanie! I think the local cafe should put this on display! This is ADORABLE! !